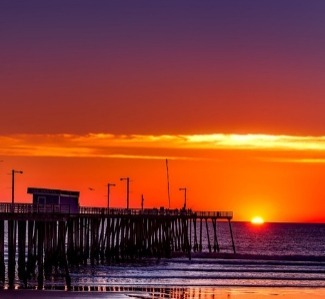 Visit the world famous Pismo Beach Pier! Pismo Beach Pier offers a wide variety of activities for all ages! The Pier area features a 60-acre beach, pier and promenade. Public restrooms, sand showers, volleyball courts, children's play equipment, benches, drinking fountains and many ocean recreation opportunities are available. A parking lot is located adjacent to the Pier and at the end of Addie Street. Handicapped parking is also available. Pismo Creek can be observed with a variety of bird life by walking down Addie Street where the creek merges into the ocean.